I don't know if you've already heard of GetGlue but, if you haven't, it's another social networking site where you can make lists of your favourite things and post what you are currently doing to Twitter or Facebook without having to visit those sites individually. 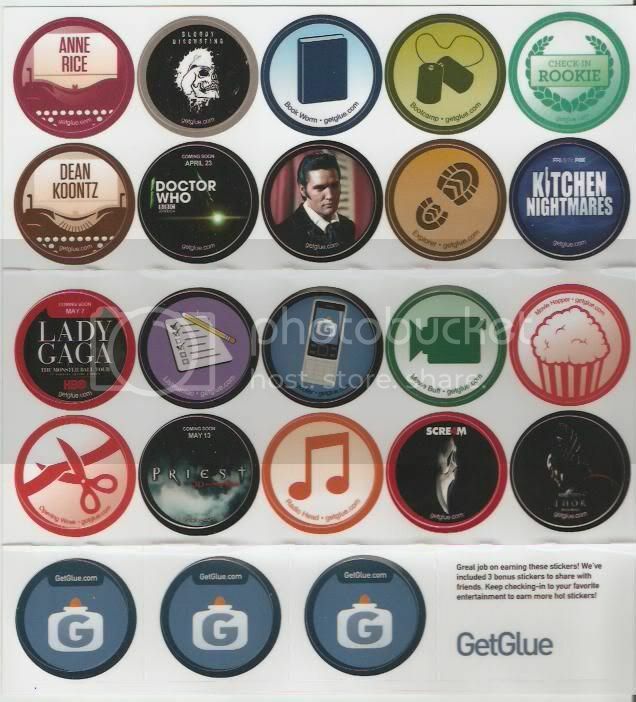 The big difference between GetGlue and similar sites is that they reward you with physical stickers which they post to you for free every time you get another 20 of them. I'm not sure why GetGlue do this except that they must get paid for promoting various forms of entertainment. I'm sure the data they collect rivals the infamous Nielsen ratings although, since it's just as likely to be flawed, I don't know if they make any money from selling it on. The weakness is that it's far too easy to just collect all the stickers whether you have any interest in the movies, books, music or TV shows offered or not. I've tried to use the site properly by just collecting stickers for things that really do interest me but, as a former user of a Nielsen scanner, I know how tempting it is just to go for the rewards offered. Anyway, yesterday I received my first sheet of stickers which I've now stuck on the lid of my Apple iBook. All that white space was just begging to be filled. The stickers are really easy to peel back off and reposition which is great for my procrastination. Yes, I like to line them all up perfectly not because I have any form of OCD but because I like things to be neat and orderly. I'm not going to take a picture though because if you've seen one laptop lid with round stickers on it, you've seen them all. GetGlue have a ton of photos on their Facebook page already from people whose sticker collections really put mine to shame. If you want some free stickers yourself then I encourage you all to join GetGlue and start liking things. It's quite addictive for a while and also a very handy site when you need to update your Facebook and Twitter statuses at the same time.